In a world where modern designer furniture is industrially manufactured and flat-packed abroad, the Cabinetmakers' Autumn Exhibition has chosen to zoom in on craftsmanship and wise hands. Partly to honour and communicate with the exquisite setting of Thorvaldsens Museum that is already a fruitful combination of architecture and art, of craftsmanship and detailing, of big visions and uncompromising ideas. And partly to bring awareness to craftsmanship and the knowledge and skill that it represents. The Cabinetmakers’ Autumn Exhibition is a platform for the development and exposure of contemporary and experimental Danish furniture design. 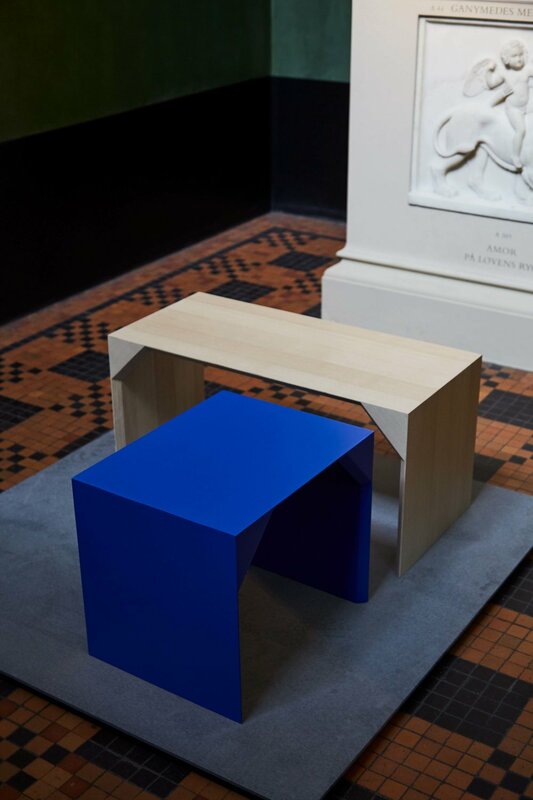 The Cabinetmakers’ Autumn Exhibition is a non-commercial association of 81 furniture manufacturers and designers who engage in an annual collaboration to create a new piece of furniture based on the theme announced by the board. Each year, new designers are represented just as the exhibition is staged in a new location and in cooperation with a new creative team in order to develop the annual exhibitions continuously. Furniture and the understanding of it must never be reduced to a fleeting fashion trend, because wise hands are a fusion of hand and mind and a historical bond of material, technique, method and style – of culture. The theme this year has the subtitle ’furniture with a maker’s touch’, because The Cabinetmakers’ Autumn Exhibition carries on the cabinetmakers’ legacy while developing it to match the current times and possibilities. In this year’s exhibition the focus is on simple but excellent craftsmanship, manifest in 41 prototypes within a practical and specific framework of 90 x 90 cm in a single colour – either the natural colour of the wood or one of the rich and distinctive pigment tones from Thorvaldsens Museum. 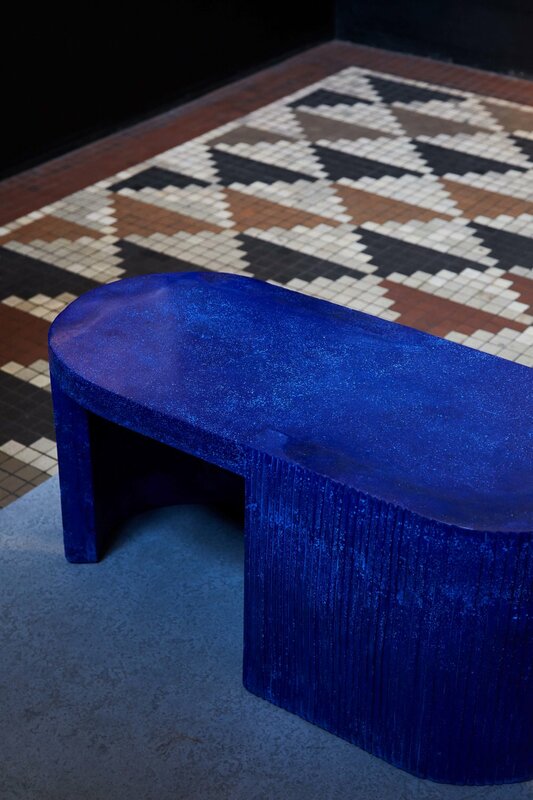 At Thorvaldsens Museum there are experimental, dedicated and hybrid furniture visions among this year’s exhibits – and the association’s members and guest exhibitors present furniture ranging from storage solutions to benches and chairs with many types in between. Freshly invented materials have also found their way to the museum, and classic woods and techniques show other sides of themselves in a clean and stringent set-up that in an hommage to the museum architecture, interior and sculptures discreetly submit to the setting and make their statements as individual furniture surprises dotted throughout the permanent exhibition. Goldilocks Design: Monique Engelund, Producent: Sune Witt Skovhus, Waggon Design: Dögg Guðmundsdóttir, Producent: Mathias Juul Overvad, The Homecoming Chair Design: Poul Ingemann, Producent: Lars de Place Bjørn, Pillar Design: Anne Brandhøj & Andrea Stokholm, Producent: Andrea Thorsøe Stokholm, Uniform Bench Design: Troels Flensted, Producent: Jotun Powder Coatings Stool - Doubt Design: Anne Fabricius Møller, Producent: Toke Overgaard. In 1838–48 for sculptor Bertel Thorvaldsen. 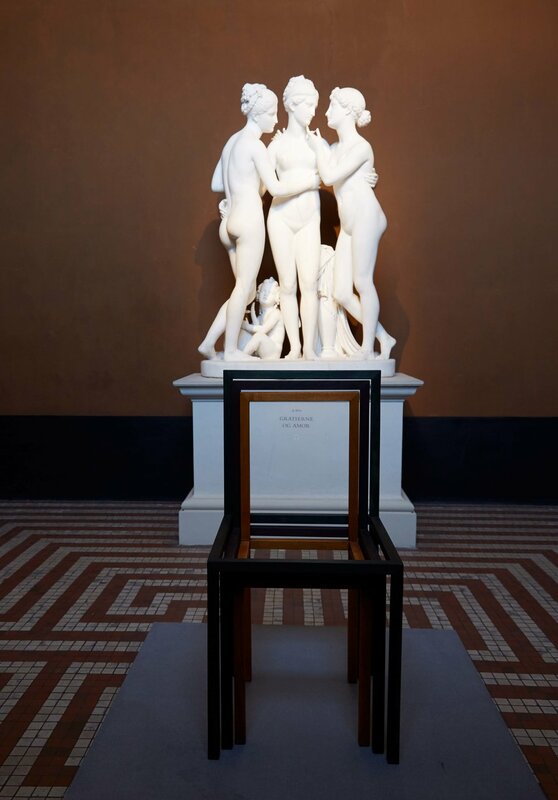 The museum mainly contains models for Thorvaldsen's marble sculptures, which in their original form are found around Europe, including in St Peter's Basilica in Rome. 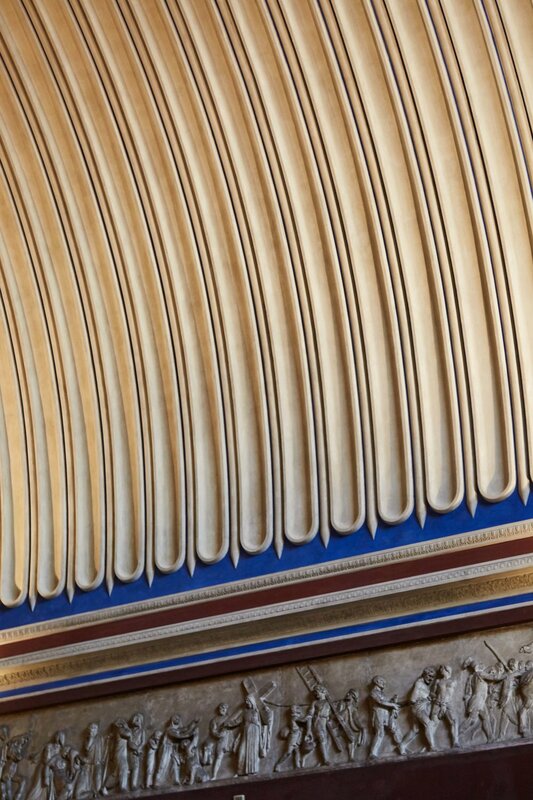 The museum's impressive colour scheme, wonderful murals and ceiling paintings and bespoke tiles were created with sublime craftsmanship by the leading artists of their time based on Bindesbøll's instructions. 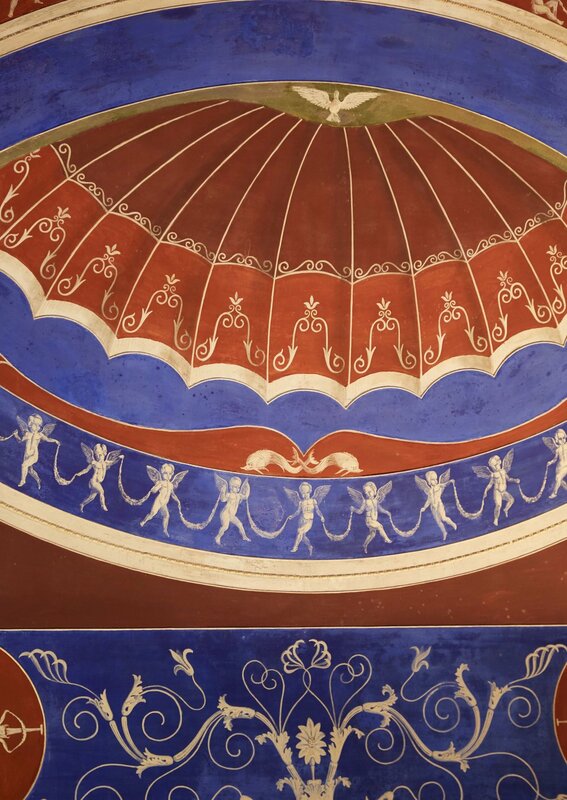 Today, the museum is regarded as an exquisite Gesamtkunstwerk, a total work of art.